I received an e-mail from a woman yesterday whom I met at the stone and tile show a couple of weeks ago. She works for a firm called Minos Stone. 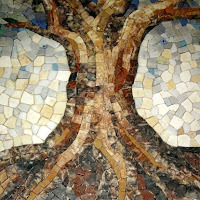 Minos stone is an Israeli-based stone and mosaic fabricator and they do work all over the world. Beautiful, amazing work at that. Toward the end of my day at the Orange County Convention Center, I was approaching overload. I thought I'd seen all I needed to see and was concentrating more on where to go for dinner than anything else when I saw this impressionist mosaic. It was huge and I'd never seen anything so expressive yet so rustic at the same time. This face has haunted me since I saw it and I'm grateful to have a photo of it now. It's a pleasure to post it here. There aren't many things in the world that can leave me at a loss for words, but this mosaic portrait is one of them. When I stood in front of it, it looked brand new and thousands of years old at the same time. It had an amazing effect on me. Still does in fact. Minos Stone does some really wild stuff and they make mosaics they way they've been made since the art came to be thousands of years ago. Individual pieces of stone are fit together to make an image. It's a simple idea but it's incredibly difficult to pull off effectively. 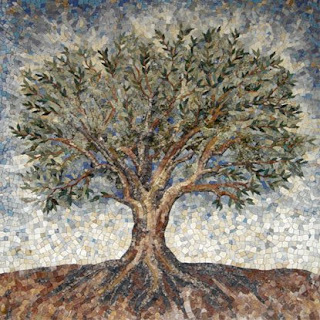 The second image is a handmade piece Minos did and it's called "Olive Tree." The beauty of a real mosaic is that the image is best seen from a distance. Yet, the level of detail up close is so captivating you can't help get as close to them as possible, even though the overall image may be distorted or lost in so doing. 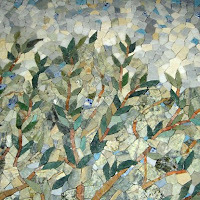 I've included a couple of Minos' detail shots of the Olive Tree so you can get a feel for what I mean. Add to all of this that they're using natural pieces of stone. To the right is a close up of the leaves and olives toward the outer edge of the tree. Here is a clear shot of the trunk and the background. Here are the leaves and sky from the upper right corner. 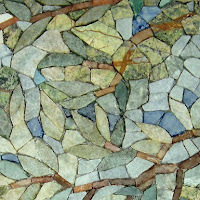 As impressed as I am by Minos' mosaics, spend some time on their website and check out what they do with antique stone floors, stone vases and vessels. Bravo!